I can honestly say its the best French Onion Soup I have ever had in my Life... THe best part, Its the First Time I have cooked it. Sorry.. It was eaten faster than a shutter on a camera. Bump this baby to the top. 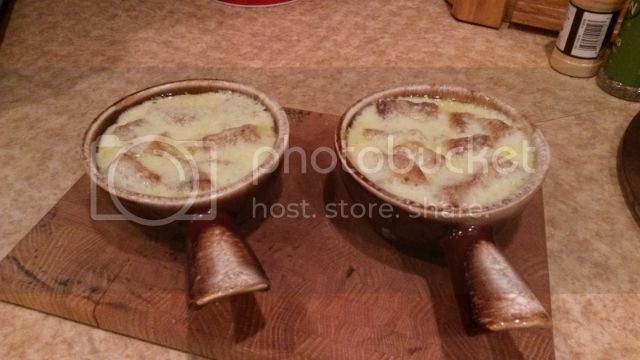 Anyone that cares for French Onion soup has to try this. AWESOME! I wasn't crazy about the way the roast turned out...it was just "ok". The soup on the other hand is out of this world. We order french onion soup every chance we get and this is as good as I've had. I would be interested to see if it turns out as good cooked without the roast. Sounds pretty interesting..Im not the big onions soup guy but the roast may pull me in.. I need pictures to visualize this. Another bump, in case there are still some that haven't tried this yet. I havent checked this thread in many years. Glad to see a few people like it. I have not modified the recipe at all, this is the way I cook it today.